Organized chronologically, the volume begins with eighteen-year-old George's letters to his parents during World War II when, at the time he was commissioned, he was the youngest pilot in the Navy. Listeners will gain insights into Bush's career highlights -- the oil business, his two terms in Congress, his ambassadorship to the U N., his service as an envoy in China, his tenure with the Central Intelligence Agency, and of course, the vice presidency, the presidency, and the postpresidency. They will also observe a devoted husband, father, and American. Ranging from a love letter to Barbara and a letter to his mother, about missing his daughter Robin after her death from leukemia, to a letter to his children two weeks before Nixon's resignation, to one written to them just before the beginning of Desert Storm, the writings are remarkable for their candor, humor and poignancy. I was skeptical at first, but ended up really enjoying this read. I really enjoyed the book. I found it never really focused on partisan issues. His use of letter showed his thoughts at the moment, and his interpretation sometimes decades after the fact. I'd recommend this book to anyone who likes political books or biographies. Thought this would be similar to the Ronald Reagan book, When Character was King. It wasn't. Interesting audiobook "reading" if you're a supporter of George Bush, Sr., but I wouldn't recommend to those not. Surprisingly interesting, I was not a fan of Mr. Bush, but I felt very differently about him after hearing his candid letters. Especially meaningful was the way he remembered his little daughter who died of leukemia--even 40 years after her death as he won the nomination for president he was haunted by that memory of her passing on that same day. Having lost a son to the same disease I was very moved--I too still weep for my child. His humanity and compassion, and humor were so evident--a side of the man most of us never saw. Great book. 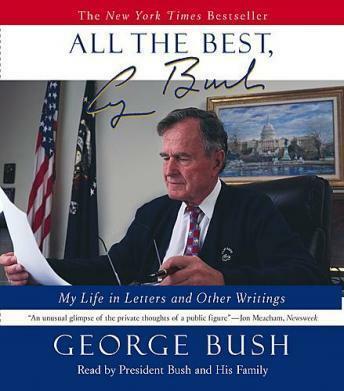 The bush family must never throw away any letter that they have ever written. Pres. Bush has been in the center of so much history. WWII, Watergate, CIA, VP, and on and on. A great book if you are a fan of the Bush Family. It is good to get to see the personal side of our public figures.